In hunting for a house, we’ve found a realtor to be invaluable. Since we’ve never bought a house before, despite doing a lot of research, we feel like this has been a whole new world that we know nothing about. 1. We did initial research online and offline. When we knew it was likely we were going to be looking for a house soon, we started investigating potential realtors in our area. We paid attention to which ones were successfully selling homes and which ones were selling homes in the areas and price ranges we were looking at. We also discussed specifics of what we were looking for in a realtor. 2. We asked friends and family for recommendations. 3. We “interviewed” potential candidates. After narrowing down the field to a few potential candidates for our realtor, we called and/or emailed them to ask them a few telling questions we’d prepared. How they responded, how professionally they responded and how quickly they responded helped us to make our final decision of which realtor to hire. 4. We prayed for wisdom. Last but not least, we prayed for wisdom in making the decision. We believe wholeheartedly that God cares about all the details of our lives — from the big things to the little things. So we asked Him to give us wisdom and direction in this process. It might seem like we went to a lot of trouble to choose a realtor, but our efforts paid off as our realtor has been absolutely wonderful. She’s honest, very hard-working and we have 100-percent confidence in her. She’s been an amazing asset to us as we’ve navigated these previously-uncharted waters — and we truly feel like we would be lost without her help! Have you successfully hired a realtor before? If so, what advice would you give someone looking for a good realtor? I’m so happy for you! Congratulations, Crystal! Someone who has lived in the area for a long time and been in the business for many, many years…our realtor could look at a property and tell you right off the bat what issues may arise. She was amazing! Yay! I can’t wait to hear more about your process! We are currently saving our down payment and love to read your tips. Especially on such a big purchase. Your tips are great. We’ve had good luck with our past realtor, and it definitely helps to do your homework. You have to be careful because it’s such an easy field to get into that some are just in it for the quick money and will just feed you lines and make promises and they you find out later they can’t keep them, aren’t prompt with returning phone calls, and aren’t what you expected at all. My friend had this experience and just wrote a post about her terrible realtor she hired. John: Read more here and you’ll quickly learn I’m a person who cares very much about saving money, but also about ROI. 🙂 The time and headache a realtor has saved us is very much worth any additional costs (though since we’re a buyer, not a seller, it’s hard to say that we would have saved money by not having a realtor). It is definitely worth paying to hire professionals in many cases — but I cannot stress the importance of doing your homework and, like you said, not just hiring someone because they are a “professional”. @john, Hi John, You would delightfully surprised at the way most of us operate. I have purchased and sold a number of houses so far and in each case my strategy has been different according to my stage in life and the health of the housing market. First home as a buyer only I hired a lady with patience for shopping around. Second time around I kept the first home as a rental and used an older Realtor to manage my property. I purchased the second home from a “For Sale By Owner”. It was a breeze, super cheap and super fun. Tons of concessions. Third time around I had to sell and buy at the same time in a softer economy. Hired the best in town Did not hesitate to pay him 6% with a rebate of 1% returned if in fact he was the purchasing agent. He has been a tiger. Sat with us and discussed a reasonable staging and updating plan. Things that I assumed as needed he declared useless and saved us a ton. He sold the house in 7 days at full price. The staging was so flawless we almost wanted to stay, Within 24 hours of listing he had the sign up, the photographer in, the edited virtual tour posted and our listing with amazing descriptions all over the web. His office manager had a 20 minutes or less average response for emails and phone calls. He was equally awesome during the purchase process disregarding the fact that we are downsizing. Looking back and two days from a side-to-side closing I would pay him up to 10% for his services on this instance. Soon we will be working on purchasing a home overseas and that will be a no realtor transaction. We recently bought our home and I have to say next time around I don’t know if I would get a realtor of my own. We had a friend of ours do it and he did do a great job and I would definitely agree that it was great knowing that he had our best interest. At the same time though, we almost didn’t get our house because the seller’s realtor was biased to people that he found on his own so he would get a higher commission. It seems that when you work with the seller’s realtor they are a little quicker to tell you the highest bidder and they are just quicker to make the sale. Anybody else have this experience? @Cindy, If you use the Seller’s agent, instead of your own, they represent both of you–and at the same time, can’t fairly represent either of you. If they told you who the highest bidder was (the amount) then they weren’t fairly representing the seller, which is a breach of contract. It sounds like the Seller’s agent was pretty selfish, and did not accurately represent the seller. We are working with an awesome Realtor right now and we did many of the same things you mentioned above. We found this Realtor through the Dave Ramsey Endorsed Local Provider, which was a great way to find trusted folks in a new city where we don’t know many people! I could see where BUYING that a realtor could come in handy – unfortunately with selling, I disagree. I have had a bad experience with them. And we’re not just talking about one either. You would think with commission on the line that they would work harder, but for us all they have done is make life more difficult. I did my homework and asked around, but truth is in the experience. In the end I did it on my own and was quite happy. I just wish I were still in the area so that I could warn other unsuspecting folks. Realtors aren’t necessarily operating in your best interest. The more you pay for the house, the higher their commission even if they are the buyer’s agent (they split the commission with the seller’s agent). It helps to have someone who lives in the neighborhood you’re buying in, as they know a lot about the neighborhood and the people who live there. I also would *not* hire any inspector recommended by the agent. We did this and got burned twice over. Just a note from a previously licensed realtor…the best selling realtor may not be the best buying realtor! I found out the hard way that choosing a realtor is like choosing a midwife…you have to “click”. My DH’s employer played a huge roll in our relocation, so we didn’t get to choose who we wanted to work with for our cross-country purchase. We looked at a handful of homes with an agent that made me cry (and I usually have a thick skin). Thankfully, the other two agents were better (though not great). Congrats on buying a house!! We are closing on our second home next week (paid for in cash, glory to God). We found both our homes by ourselves and just represented ourselves when making an offer and during the purchasing process. My dad has always found his own homes (long before the internet and cell phones), so we never thought to find an agent. However, we do think an excellent agent is invaluable in selling a house! Congratulations! I am excited to read more about your home purchase. It’s so inspiring to me and my future hubby! I agree about the whole realtor thing. I think it’s unfortaunately a hassle with or without them. Either they don’t know what they’re doing or they’re pushy and rude. Oh well! I was so happy to see this come across my feed-reader this morning. We are returning to the US this summer and hope to begin house hunting immediately. I was curious about your “interview” process for agents. How did you and your husband determine what kind of questions to ask? As a first time buyer I am nervous about making a quick decision because of the time constraints on our arrival home / purchase time line. Your suggestions seem really sound and are something that we can do before we even arrive. I’m really interested in the set of questions you asked too! We won’t be in the market till about forever from now, I think. But just in case . . . I’d love to know. Thanks! I do not recommend the process we used to find our realtor, but God worked it out! My husband randomly emailed a person or signed up on the website or something. She sent us an email, and my husband said we’d be in touch when we wanted to buy a house. We followed up on our word, and she turned out to be the best realtor we could have asked for, especially in the ensuing drama that unfolded. The Lord can work blessings even through people who haven’t a clue what they’re doing! When we did our first house (and only, to date) house purchase, we went with someone I knew and trusted. We “clicked” with her, trusted her to really have our best interest at heart, and were impressed by her personal professionalism. We never regretted it! When it comes time to sell in a few years, however, we will probably do as you did and research more fully. Has anyone here ever used a different realtor to sell and to buy, at the same time? Is that even acceptable? @Susan J, If you are moving locally, it would probably be wise to have the same realtor for both. It would save you the hassle of needing to communicate similar information to two different people. If you like the person who is selling your house, why would you feel a need to get someone else to help you buy? We moved 1/2 hour west during our last move, but our realtor was a member of the realtors association of both towns (2 different market areas), so she handled both aspects. She knew both areas well, and we were very well-represented in the whole process. 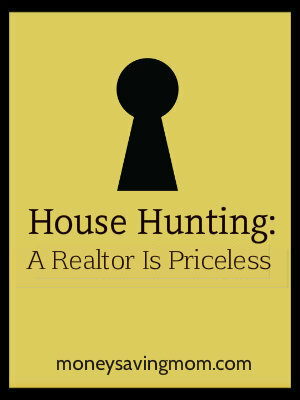 Getting a realtor who is a good fit is the BEST piece of advice anyone gave me when we were househunting! Usually we are DIYers, but we got a realtor when househunting because having one probably wouldn’t have saved us much money and because we were in a big rush, and it really sped things along. She did the bulk of her work after we found the house and were getting all the documents written up. My credit union provided me a financial incentive (I forget how large, but in the three figures) if I chose a realtor through their referral. We investigated that avenue, but that realtor was pretty condescending and we do not regret choosing someone who was much more comfortable with our small budget. I am a licensed realtor, although I work for a builder selling new homes and am happy to see you’ve found someone you can trust that will help you. Here is something a person I respect in business told me 20 years ago….10% of the Realtors, do 90% of the business….find that 10%! The other poster was correct in that many Realtors specialize in “listing” while other do in “selling”. Good luck! one other thing, in some states attorneys(like Jesse) can collect the 3% realtor fee….just food for thought in the future! Don’t use a friend or family member who is a realtor. It’s really hard to tell them when they aren’t doing a good job or you don’t want to sign with them to be an exclusive agent deal. Also don’t use their house inspector…get your own. That way you know they are working for your best interest. We got burned on both of these. We’ve also use Dave Ramsey ELP’s (Endorsed Local Providers). It’s a good way to start. He has them for realtor’s, financial advisors, insurance, etc. We just bought a house 7 months ago, and my best advice is don’t be afraid to fire a bad match. DO NOT worry about their feelings if you’re not comfortable in your relationship. After your research shop around for the right person talk to a few people at once so you don’t get commited with one person before you’re ready. If you have a bad feeling about anything STOP what you’re doing and start over. Better to be at square one than negative 200,000. I also agree with getting your own inspector, although I LOVED my realtor, I wouldn’t want to put any blame on him if somthing went wrong. ALSO especially if you’re buying in a big city, get someone who is willing to go into detail about crime rates and if you will fit in culturally. There is a list of things they are NOT allowed to tell you, and I get why, but it was important to me to fit in. I have two babies (and one on the way) and my husband is in the military and is sometimes gone for a year at a time. It was important for me to be in a “young” safe neighborhood where I wouldn’t be a target and where there were other families with little kids. It’s exactly what we got and I couln’t be happier. Good luck, and sorry for the super long post it’s all just so fresh in my mind. There is NO REASON not to use a Realtor when buying a house. It costs NOTHING. The seller pays the realtor fees. So it is in your best interest to use a Realtor. When you are buying a house, realtor selection isn’t as difficult as when selling. You really need someone that you can tolerate spending time with. We went out many times looking at homes with our Realtor and her upbeat personality was key. Also, make sure they have no less than 2 years experience. Any less and they may not be able to answer your questions. @Suzette, Yes, but as a buyer, your realtor will get a cut of the commission (shared if it involves 2 realtors) even if it’s not coming out of your pocket, so it’s still possible to be snowballed into a purchase just so that they get income. They don’t always represent you, but rather their own pocketbooks. Also, you may want to check with your local Realtors association. They will be familiar with different Realtors and will be able to recommend someone. The way we found our Realtor was because we went to an open house she was hosting. I have to say that I love the quote from Dave Ramsay on his website, ” Find a Realtor that has the heart of a teacher, not a salesperson.” As the wife of a Realtor here in OKC I have to say this is SOOOOO important. I truly think this is the most important thing. When you find a realtor that truly WALKS you through the process then you have found a wonderful realtor. Especially for a First Time Homebuyer you someone to teach you the process! One other important thing is someone that gets back to you in a timely manner. It amazes me how some people say they can’t get a hold of their realtor! Congrats on your new house! Such a fun and exciting time in your life! The realtor we use when we bought our house was really nice as a person – she was flexible to your schedule, quickly return your phone calls etc.–. However, I believe that I could have got the house at a lower price. I believe that their best interest is to sell a house at the highest price possible, so that their commission is higher. If you find a house you like, it’s best to research on your of the value of the house. And, also one of the comments she made stuck with me – “it is easier to sell a house for a first time buyer”. I realized why she made her comments after moving to the house, which was too late to correct. Thus, my advice is, although you get the housing inspection done, it’s always better to have a friend or family who owns a house to visit it; they may have more comments for you, especially if it’s not a new construction. Good Luck! I definitely see the value in a realtor but want to point out that there is a cost to the buyers. If you’ve ever sold a house, you know that when evaluating offers, you consider the entire offer, which includes the offer price MINUS commission. Therefore, if there is no commission for the seller to pay, they can accept a lower offer. as someone else mentioned, i was a little surprised to see you advocating a realtor but your response completely makes sense. i think realtors are essential. we’ve used four different realtors to represent us and had great experiences with all but one. all were recommended to us. the irony is that the one we did not have a good experience with had been recommended by another realtor rather than a client (note to self). the housing industry is one that unless you’re in it day in and day out, you just don’t know what you don’t know. it also changes all the time so it’s crucial to have an expert guiding you. When selling your home, make sure there is a clause that says you can fire your realtor for any reason. There will likely be a fee associated with it unless there is a breech of contract. I have had more than one friend that was stuck with a realtor that wouldn’t return calls and didn’t seem to do anything, because their contract stated the realtor would get a commission if their house sold within the stated amount of time. The realtor we used to sell our home did have this clause, and it gave us the confidence that he was committed to do as much as he could for us. Congratulations, Crystal! You’ve given us lots to think about! Thank you so much for posting! Congratulations Crystal on the purchase of your first home. What a wonderful time! May God bless you and your family. Crystal, your recommendations for finding a good Realtor are right on the money. I have my real estate license and find excellent Realtors for people all around the country as part of my job, and those are the methods I use. Sometimes I can’t ask people I know because I’m looking for a Realtor in an area of the country that I don’t know anyone personally. When that’s the case, I rely on my experience from having worked for a real estate team who has their clients’ best interests as their top priority, and my experience having found dozens of great Realtors in the past to ask potential Realtors questions that get to the heart of how they do their business: Are they client-centered rather than salesperson-y? How much of their business is repeat and referral rather than from their advertising and self-promotion? ….and so on. I’d love to see the list of questions you used when “interviewing” your Realtor. @JellySandwiches, ME TOO!! I interviewed my so-called realtor twice, got credentials and stats, even spoke to people that had good things to say about her…..in the end, we argued a full month about how she was incorrect in measuring the square footage of the home (in the end she brought her husband in to help her measure since she thought that we we’re holding the tape properly, when he ended up telling her the same thing we were! ha!) and in 6 months, she showed it an entire 3 times! As soon as the contract was over, I ran an ad FSBO and showed it 3 times in the first weekend and had at least 2 every week there after. I thought I did all the right things and asked all the right questions and worked for months to pick her, so I would LOVE to see your questions to compare notes! Thanks! When we sold our last house, we tried to go FSBO, and then used a realtor after a while when it didn’t sell. In the end, I was glad we didn’t sell it ourselves, because it is really such a complicated process. Also, we bought our house using a realtor, but from people selling by owner. It was a nightmare! THey didn’t know what they were doing and understandably didn’t trust our realtor, and caused so many unnecessary problems. I know that sometimes you want the specific house, but in the future, a house would have to be pretty much perfect for me to go through that again. @Nony (A Slob Comes Clean), Still a profit involved for your realtor – those selling FSBO are forced to pay commission because you brought the realtor in – I’m certain that there were LOTS of negogiations and added paperwork and that it might seemed impossible and painstaking long, but had you bought directly from them, you probably would have had a less painful process and I dare say, a lower price. Actually, we paid the realtor fee. We had been looking with her for a year, and wanted her to be part of the process. Well, that’s good – most won’t – or at least that’s been my experience. I had several people want us to pay the realtor THEY brought into the mix. That was a no-go for us. Wow! How exciting for you Crystal. I’ve been following and enjoying your blog for quite awhile now and you give me so much inspiration. Not to mention all the money you helped me save on shopping. I’m striving to be debt free soon and also hope to purchase a home 100% down. Congrats to you guys. There was a very interesting study included in the book Freakonomics, which found that realtors will wait longer for a better offer when they sell their own home than they will for a client’s home. Why? Well, if you sell your home for, say, $100,000, if 2 realtors are involved they’ll split a 6% commission–$3,000 each. Say you could instead wait a little longer and sell your home for $105,000–an extra $5k in your pocket!–but only an extra $150 in commission to each realtor. This is my biggest frustration with realtors and the biggest reason I think the commission system is the best only for realtors, not home buyers/sellers. Realtors are better off getting a seller to take a lower offer quicker–they spend less time and getter a better return on their investment of time, effort, money spent on advertising, etc. A realtor will move a client’s property quicker because a small difference in sales price barely affects their commission, but the difference in sales price can mean a lot more money for the seller (which realtors are themselves, sometimes). I have no problem paying a realtor for a job well done, but I think the commission system is unfair, pays realtors more than the large majority deserve, and is designed in a way that does not have a seller’s best interests in mind. I also think that there is an unspoken agreement amongst realtors to exclude FSBO properties simply because they are FSBO. One realtor I worked with told me that he never even shows FSBO’s to his buyers simply because they are FSBO’s. Yes, the buyer’s agent usually still gets a commission, but FSBO’s represent a direct threat to the commission system and realtors jobs themselves, and I think realtors do their best to keep these properties out of buyer’s radar. We went with a recommended realtor to sell our last house-couldn’t get it sold FSBO. She was awful! I don’t think we could have had a worse experience. We researched realtors when we purchased our new house and it was a whole different world. Doing your homework is truly all the difference. I also agree with the statement above about doing what works in different stages of life. We have purchased 3 homes, sold 2 and have done something differently each time. Thanks for sharing with us. I was wondering the status of your house buying! What wonderful news. God bless.